Crazy schedules meant Jessica and I had to take an unexpected mini-break from blogging last week. Now that we have a few projects wrapped up we are hoping to get back on regular schedule and get some much needed sleep. We threw our annual Halloween party over the weekend and had so much fun. We had a lot more guests than we did last year and honestly I was a very worried about pulling a party this size off. I had the usual worries about seating, activities, keeping everyone mingling, and having plenty of food. Everything ended up going so smoothly and I think everyone had a great time. It was so fun seeing everyone in costume and spending a few hours laughing and having fun with some really great people. At our party I noticed that one of our friends had the prettiest silver, sparkly iPhone case. 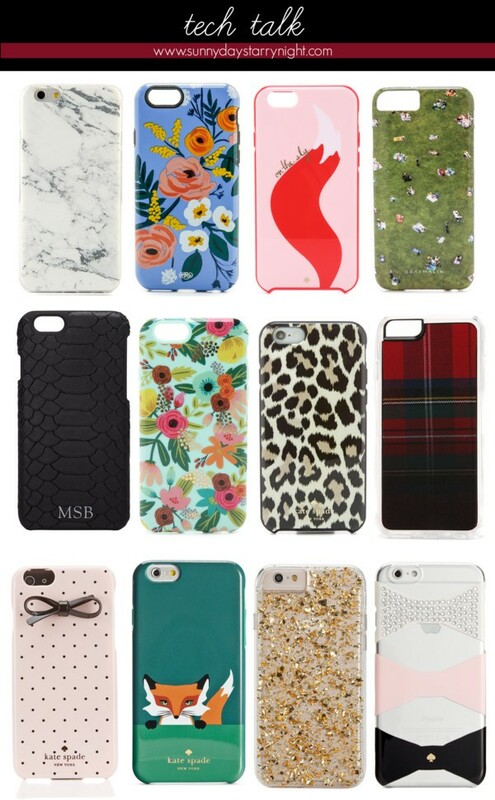 Over the last few months I've noticed that she she has a great collection of cases and is often switching them up. It has made me realize that I really should start changing mine up more often too. As much as I love accessories I have found that I often go months and months at a time without ever considering updating my case. I have rounded up some of my current favorites above. I think this chic marble case may be my favorite. Do you change your phone case often? What kind of case do you currently have on your phone? That fox phone case is to cute. I don't change the case very often. I love the kate spade one. I love the fox case too but I'm with Mila, I hardly ever change up my phone case! Right now my case has been on for over a year and it hasn't come off yet. I wish I changed it up more.